TVT Green Oil Additive is a major breakthrough in lubrication technology to fight the friction and wear of metal components in engines. Within minutes of use you can hear and feel the difference TVT Green makes in your engine. You will notice reduced engine noise, reduced vibration, and improved fuel economy. 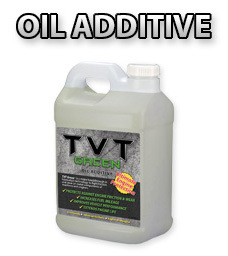 Your engine just runs smoother with TVT Green Oil Additive! INSTRUCTIONS: Add 1.5 ounces TVT Green Engine Oil Additive to each quart of engine oil. Friction is the enemy of engines. It requires more energy to create movement; it wears and abrades material, and creates unwanted heat. 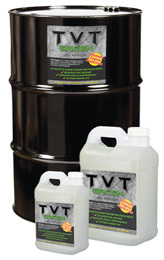 TVT Green Oil Additive is an industry changing antidote. 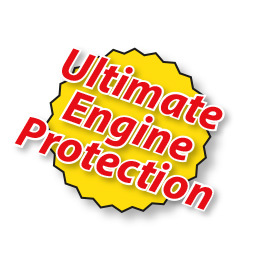 It is an extreme pressure, anti-friction metal treatment for engines and machines. Unlike other lubricants which are topical and reduce friction by creating a thin wedge between two metal surfaces, TVT Green penetrates into the pores, filling the gaps on a molecular level and minimizes the micro points of contact. The formula actually changes the surface structure, making the metal both smoother and harder. The end result is that friction is dramatically reduced. The bottom line includes: Lower operating temperatures, longer engine life, and smoother, quieter operation with greater power and energy efficiency. TVT Green is a proprietary technology that is compatible with petroleum and synthetic oils, and does not change the operating properties of those oils. It does not contain ethers, graphite, Teflon, fluoropolymers, zinc, EPA targeted chains, solids or molys. It is non-flammable, non-corrosive and non-toxic. OSHA 29 CFR 1910.1200 – lists no ingredient of this product as hazardous and is not HAZMAT reportable. Available in 1, 2.5, 5, and 55 gallon sizes.